This jacket will keep you very warm. We personally recommend them, pictured is the owner of Garb the World in her black and red jacket with pockets and trim and a matching (Mongolian) hat. Please provide your color choices, side opening choice, as well your height, chest/waist (which ever is larger) and arm sizes (in inches) when ordering. 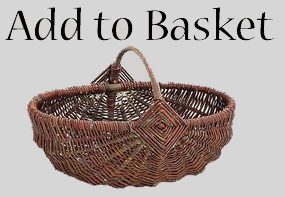 NOTE:This is a Custom-made order and may take up to 4-5 weeks. 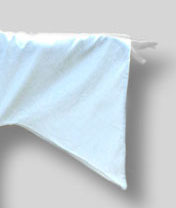 Check out our pre-made garments for quicker delivery. 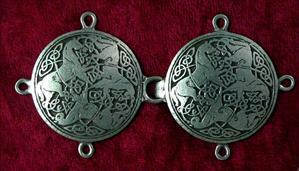 Add Celtic Canines Clasp (additional $20.00). Add Trinity Clasp (additional $20.00). Add Horse Clasp (additional $20.00). Add Comedy and Tragedy Clasp (additional $13.50). 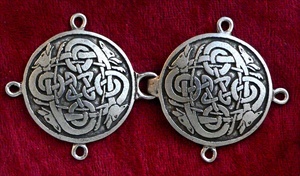 Add Dublin Silver Clasp (additional $11.50). Add Fleur de Lis Clasp (additional $12.50). Add Leaf Clasp (additional $12.50). 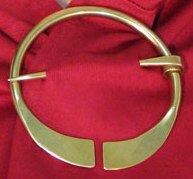 Add Brass Large Penannular Brooch (additional $10.00). 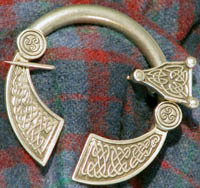 Add Pewter Large Penannular Brooch (additional $35.00). Add Wood Cross Made in USA (additional $10.00). 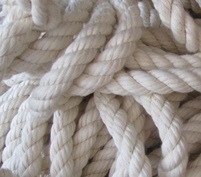 Add 1/2 inch rope belt Made in USA (additional $15.00).